As a New York State Workers’ Compensation claim progresses, most claimants are interested in understanding their options for possible settlement, also known as a Section 32 agreement. That could happen early in the case, or more commonly, as the case progresses and a finding of permanency has been made or is about to be made. Injured workers are entitled to negotiate a lump sum settlement. This settlement would be paid in place of weekly disability payments. If workers do not wish to receive one lump sum, or an insurer refuses to pay in such a manner, then workers may negotiate a structured settlement, which may be paid in several payments over a specific period of time. A Section 32 agreement may settle all or a part of a worker’s claim. For example, a worker may negotiate a settlement for lost wages only, or a worker may agree to a settlement for lost wages and medical benefits. Are There Advantages of Taking a Settlement? A settlement has some advantages. It can provide income quicker than going through the court system. There is a risk that a worker may receive less compensation through a judge or jury’s decision than through a settlement. Another possible advantage is the opportunity to seek compensation for medical care a worker may need in the future, even if it is unlikely. 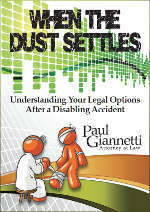 Accepting a settlement can put an injured worker at a disadvantage. By accepting a settlement, the worker gives up the right to future medical benefits. If the worker requires expensive medical care down the road, the settlement may not cover it all, and the worker would be forced to pay out of pocket. Lump sum settlements are often spent quickly, and workers find they do not have enough left over to pay for future medical care. When an injured worker is interested in negotiating a lump sum or structured settlement, they need to be aware of how much their claim is worth. However, a big mistake of unrepresented claimants usually make involves ascertaining the realistic value of their claim. Many people simply look at their lost earnings and the physical and emotional turmoil that they have endured as a result of their injury. Unfortunately, properly evaluating a case for settlement is much more complicated than that. In order to reasonably value a Workers’ Compensation claim, you must know the specific Workers’ Compensation Laws that effect your case and your entitlement to benefits. You must have a realistic understanding of the insurance carrier’s possible exposure in the case and the length of time it may take for the legal process to conclude. The extent of the injury and whether the worker has suffered a partial permanent disability. Properly evaluating a case for settlement can only be done by someone who fully understands relevant Workers’ Compensation Laws as well as the practical workings of New York State Workers’ Compensation system. Another consideration when settling involves the concept of present value versus future value. In many instances a settlement involves a complete buy out of indemnity or lost wages benefits. The insurance carrier is not likely to offer you the full value of your estimated future payments. Instead they will discount that amount significantly. Part of that discount will be a reduction for the present value of the potential future payments.